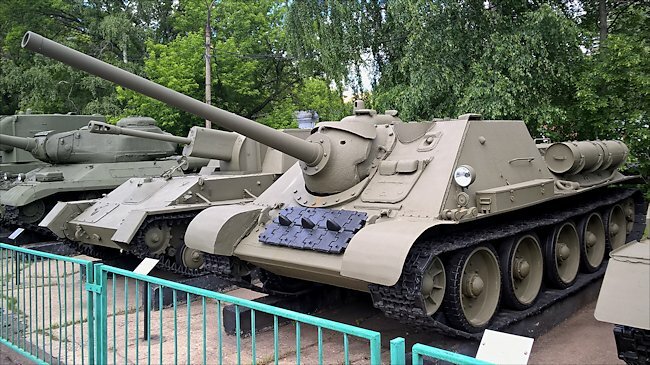 Restored SU-85 WW2 Soviet Tank Destroyer at the Central Armed Forces Museum, Moscow, Russia next to a SU-100. Look at the different Commander's Cupola styles. 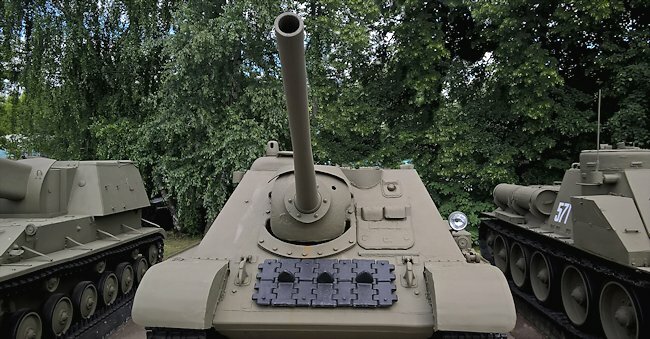 The Soviet SU-85 tank destroyer was designed by Lew S Trojanow in 1943 to deal with the increasing threat from the German Army the up armoured Panzer IV tank new medium Panther and Tiger heavy tanks. The T34/76 and KV-1 tanks 76 mm gun was finding it difficult to knock out these new opponents. It weighed 39.6 tonnes and was powered by a V-2 12-cylinder diesel 500PS engine that produced 493 bhp. This gave the SU-85 SPG a respectable top road speed of 55 km/h (34 mph). It was armed with an 85 mm D-5T gun which was later fitted into the newly designed larger turret of the T34/85 tank. The D-5 gun started off as a powerful high velocity anti-aircraft gun designed to hit high altitude German Bombers. The letter 'T' at the end of the guns name indicated that this was the variant of the gun to be used in Tanks. The gun had a had a rate of fire of 10-12 rounds per minute with a muzzle velocity of 792 metres per second. It could only penetrate a Panther and Tiger Tank’s frontal armour at 500 metres but its shells could smash through the frontal armour of a Panzer IV and StuG III at 1,000 metres. Compared with the firepower of the German 88mm anti tank gun it was in second place. This was why the Russian Artillery engineers quickly designed and manufactured the 100mm Anti tank gun that was fitted to the later SU-100. The prefix letters SU stand for the Russian words Samokhodnaya Ustanovka - self-propelled unit and the numbers 85 the size of the gun. The 85mm gun was mounted on the chassis of a T34 tank in an armoured casement with very good slopping frontal armour that helped deflect incoming enemy shells. Using the same chassis as the main battle tank meant that there was no problem with maintenance and spares. The German Army tank destroyers and assault guns used the chassis of a multitude of foreign captured tanks which made maintaining a store of spare parts a nightmare. The SU-122 was the first large self propelled gun to entre service with the Soviet Army. This was armed with a 122mm howitzer. It was designed as an armoured artillery gun that could keep up with the Russian armoured forces. It fired high explosive HE rounds not armour piercing rounds. It could only engage tanks at very close range for its shells to have any effect. It was meant to be used to blow up enemy strong points in urban environments and fortifications like concrete machine gun and anti-tank posts in the country. The SU-85 Tank Destroyer was built on a T34/76 tank chassis. 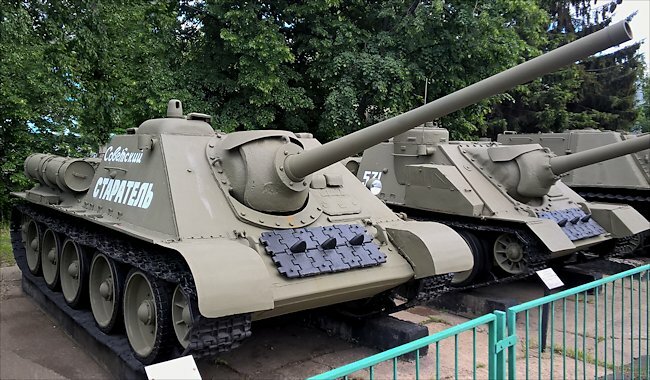 The SU-85 tank destroyer entered Red Army service in August 1943 where as the SU-122 saw action around Leningrad (St Petersburg) in January 1943. It remained in service until the end of the war. Many of the design features of the SU-122 were used in the development of the SU-85. Production of the SU-85 tank destroyer was stopped in late 1944. It was replaced by the T34/85 tank and the SU-100 tank destroyer. Around 2,050 vehicles had been manufactured and continued to serve on the front lines. Where can I find other preserved SU-85 Tank Destroyers?